Imagine if Arnold Schwarzenegger only really bothered with one arm. He had his favourite which he lavished attention on, lifting weights with it, waxing it and giving it a lovely, weird looking, fake tan. Maybe even a real one. The other arm, he didn't care so much about. He didn't exercise it, he let it get all hairy and normal, he covered it with a blanket every time he sat in the sun. To modify that Clive James quote, imagine if "Arnold Schwarzenegger (had one arm that) looks like a condom full of walnuts." 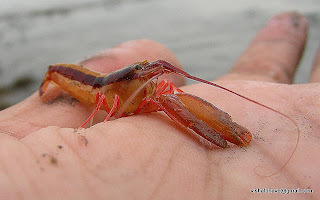 That's a Pistol Shrimp! Or it will be once you include all the stuff that make people different from shrimps. There's quite a few of those. So why does the Pistol Shrimp have one massive claw that's more than half the size of its body? To be utterly amazing, of course! It doesn't work as a pincer at all, but like a... pistol. 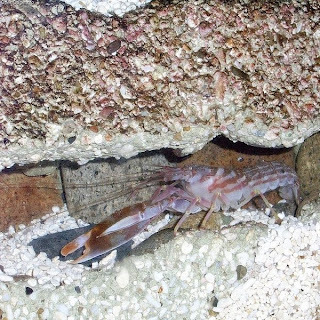 Hiding out in its burrow, the Pistol Shrimp extends its long antennae to sense prey such as fish or other shrimps. Once something tasty is detected, the pincer is cocked (locked and ready to rock). It kind of reminds me of this girl I knew who was double jointed and could do ghastly looking things with her thumb. Once ready, the Pistol Shrimp simply closes its claw and fires a, and you're gonna want to hold on to your titanium hat for this, it fires a SQUIRT OF WATER!!! AAAAARRRRrrrrgghh.. what? Indeed. It's a Water Pistol Shrimp. It's just that the water squirts at a speed of some 60 mph (97 km/h), fast enough to cause cavitation. Basically, it produces a bubble that quickly collapses due to the surrounding water pressure, squashing the gaseous water vapour inside. This causes a remarkable increase in pressure and an extraordinary increase in temperature. In fact, the bubble reaches some 4,700 °C, just under the Sun's estimated surface temperature of 5,500 °C. The SUN! It's a VERY good thing that this lasts for virtually no time at all, or a whole bunch of stuff would just melt away! The Pistol Shrimp is actually making use of a shockwave that emanates from the collapsing bubble, it's like a reusable, hand held stun grenade. Whereas the Mantis Shrimp used its power to crack open tough crabs and snails, the Pistol Shrimp prefers to stun or kill softer bodied prey with one shot. BOOM! There are a couple other side affects of the Pistol besides a stunning death. One is sonoluminescence, where the collapsing bubble produces a spark of light to go along with the heat. It isn't as bright as the Sun, and for that we should be grateful, neither does it last for long. Basically, the Pistol Shrimp doesn't melt or blind its surroundings. Seems so strange to point that out when we're talking about a 2 inch shrimp, but this is no ordinary shrimp! It can make a bubble, after all. A bubble of such importance that if the Pistol Shrimp loses its monster claw, the normal one will start to grow huge to take its place. There is one other astonishing thing that this bubble can do: it makes the Pistol Shrimp one of the loudest creatures in the ocean. It's a popping sound that has been measured as some 218 decibels, while the human eardrum can rupture at around 150 decibels. You might want to keep back a little! And it really is an effect of the bubble, not the snapping shut of the claw. Doesn't stop them from also getting called Snapping Shrimp, though. The noise they make rivals that of our very own Sperm Whale, which is particularly remarkable when you consider that these shrimps are smaller than a Sperm Whale's tooth. It also allows them to communicate with each other. Which brings us to something else which I find very interesting. Some Pistol Shrimp are social. Colonies with 300 members have been found living in sponges, all of them the offspring of a single, large female who acts as queen. There are workers who look after the young and soldiers on defence. It's just like ants in the ocean! Amazing! Other coral reef Pistol Shrimp team up with a fish called the goby. The shrimp digs the burrow for both of them to live in, but he always makes sure his antennae is in contact with the goby. Gobies have better vision than shrimp so when danger is spotted, a flick of the tail sends a warning and they both dive to safety. Clever stuff! And it's good to see that at least some Pistol Shrimp can ask questions first and then maybe not fire at all. Packing as much heat as the sun is all well and good but sometimes its nice just to relax with pleasant company and chat. Or dig a big hole or whatever. It's better than shooting them and eating them, anyway. Wow. That's impressive stuff!!! Smart, armed, social. Who would've thought?! All right, you've got me covered now. ;) I still think the Mantis Shrimp would win in a fight. That very clip you embedded is the one where I first learned about the Pistol Shrimp, and even though I love the animal, I hate the way they edited the clip. It's a documentary about sea life and the lead-in is about how noisy the ocean is. So why do they completely cover up the animal's natural sound with dubbed gun sounds, every single time? That other clip you linked of the actual sound is far more impressive to me. Too bad it isn't as informative as the one with the fake sound effects, and good thing we've got both. @texwisgirl: Yes! It's a very interesting little shrimp! @Crunchy: Woo! I think the Mantis Shrimp would win pretty much anything it wanted to win. I see what you mean about the clips. It's always a shame when the actual animal in question gets lost beneath all the other stuff. Quite a story! I don't know for sure if the tail will grow back, but it may well get a new one when it moults again. I don't think it would come back before they grow into a new exoskeleton. I find the bigger, faster, smarter, more visual arthropod that also uses shockwaves but can also land blows directly to be a lot more formidable.